Time-out at Surico Alpaca Farm is a relaxing change of pace activity. One that broadly appeals to young children and adults, generally interested in animals and/or farming of the same. Farmed for their luxurious fibre from which clothing, toys, duvets etc. are made, alpaca are low maintenance animals requiring little in the way of vaccinating, drenching or special food; unlike sheep. They don't turn tail and run like sheep as soon as you look at them either. Gentle and submissive, the appeal of alpaca is hard to resist. They make great pets too. 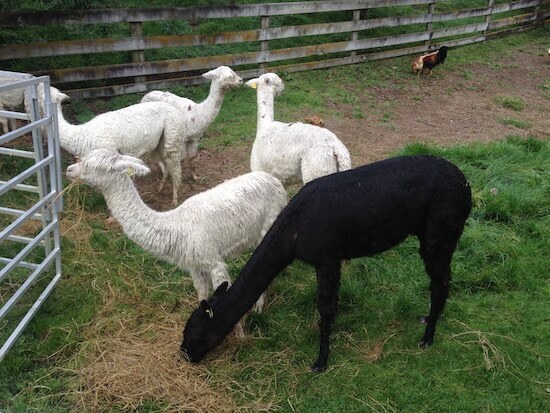 Designed for both education and interaction, this tour will teach you a whole lot more about how alpaca, native to South America, are farmed in New Zealand; from breeding to stud services and shearing to processing the fibre. 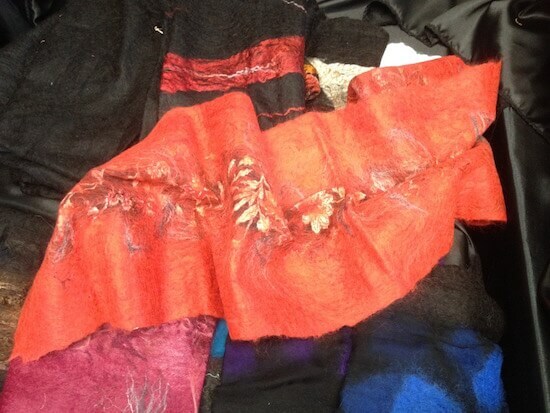 Gorgeous scarves made out of alpaca fibre. It's a thriving industry to all intents and purposes. Who knew? And talk about technical. The people in this industry get right into it. For instance, Alpaca, like horses, come with a pedigree. Right down to the point in time when last mated and who with. "How rude." I thought. "There's just no privacy anymore." Surico clothing and toys made out of alpaca fibre/fleece. 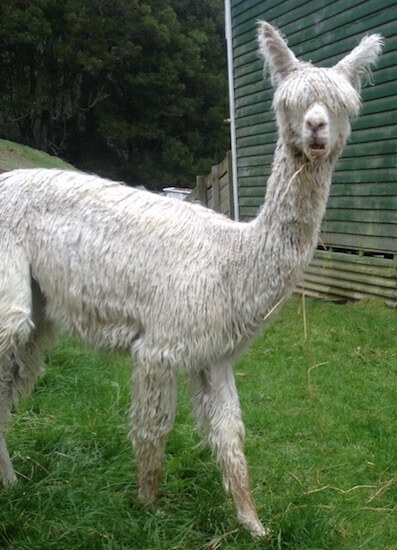 From small beginnings as a hobby farm up north, Surico has grown big enough to become a leader in the field of alpaca farming in New Zealand. Sue and Hermione, the owners, have about 133 and know every singe one. 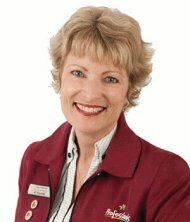 If you're the least bit interested in alpaca farming for yourself, these are the people to talk to. 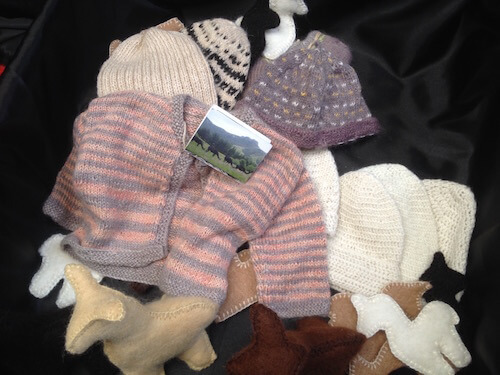 On hand, alpaca products are available for purchase. The other side of the tour is getting close enough to stroke and lead an alpaca. A novel experience is the feeding. Not shy, the animals will come right up to you looking for treats (supplied) and with soft, rubbery lips, eat right out of your hand. Normally, alpaca feed on grass, hay and tree foliage but they do enjoy their treats. Take advantage of a sunny day to take some fantastic photos because in part, the farm overlooks Lake Rotorua. Plant an alpaca in the middle of your frame and voilà, an excellent keepsake. You don't expect to visit an alpaca farm and fall in love but that's what can happen. 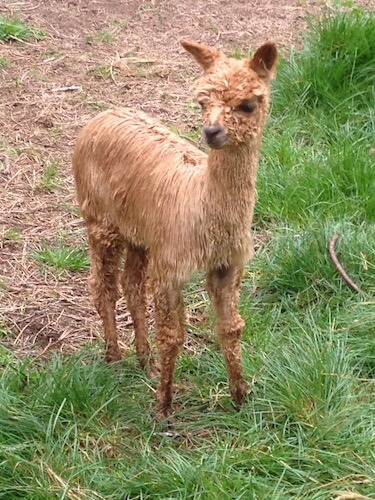 Meeting the likes of Lara, a baby alpaca (cria is the correct term) and finding out she's an orphan, well, say no more. The ohh's and ahh's begin. Scruffy and dirty looking, she was the embodiment of an orphan. Look at that little face and tell me she doesn't tug at your heartstrings. Surprisingly, her appearance was the only orphan-like thing about her. A true little Miss Independent, she held herself aloof but certainly wasn't shy of strangers and happily ate out of hands extended with food. Like any good woman though, she was quite particular about whose hand. Now, a girl's gotta do what a girl's gotta do, right? In this case, Lara helps herself to the teats of an adopted mother when wanting milk, then wanders off to do her own thing again. Ain't nobody telling Lara what she can and can't do. Doesn't he look goofy? It must be the uncut fringe. Apart from Alpacas, you might come across a rooster with his bevy of hens, or the quirky resident cat. While I was visiting, he picked his way daintily across the paddock, leapt onto a table chock-full of treats in paper bags, had a good sniff and finally made himself comfortable by sprawling all over the bags. 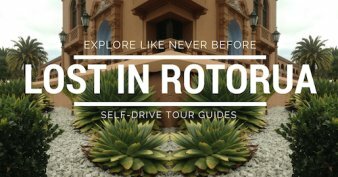 With no minimum number for the tours you can expect a personalised visit. 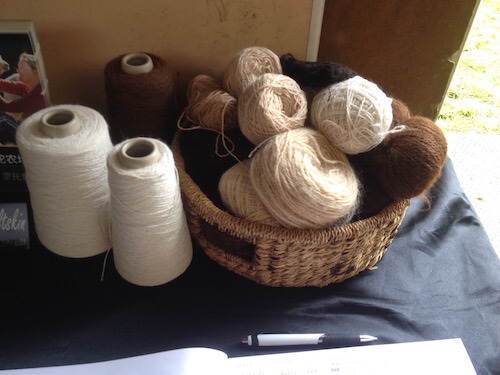 There are two types of alpaca, the suri and huacaya. If it looks like a fluff ball, that's a huacaya. If the fleece looks like long dreadlocks, it's a suri. 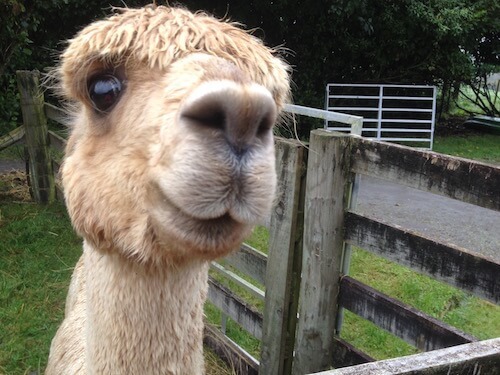 About 90% of alpaca in New Zealand are the huacaya. A group of Alpaca will usually all poo in the same place to keep the rest of their area clean. That might explain their hardiness. Staying along those lines, one thing I found hilarious is the way they pee. The hind legs are splayed, the little tail flips up and off they go. The pee doesn't come out in one straight line either, it's more like your round garden sprinkler. I know, too much information. The Alpaca make a sound like mewling babies. 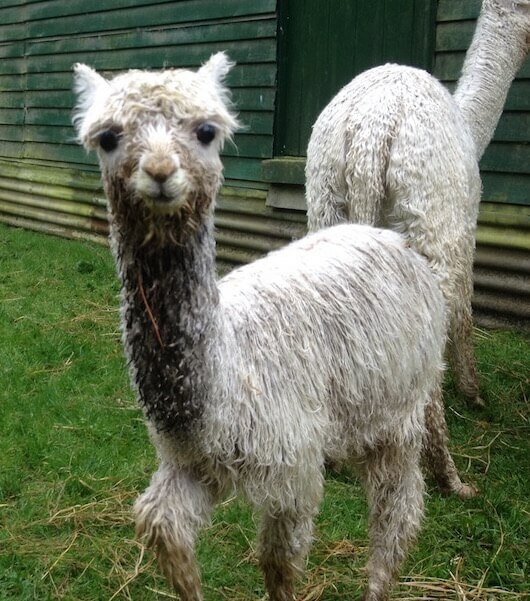 Alpaca pregnancies last for 11-11½mths - those poor mothers. And they can get pregnant at any time by ovulating once mated instead of coming into season like most other animals. When alpaca give birth it's termed, 'unpacking'. Alpaca have two toes on soft padded feet. Shearing happens once a year. The fibre is easier to clean than wool because it doesn't have the oil. This is not the place to be hauling a 100+kg person around in a wheelchair. The ground is uneven (it's a farm, after all) and your charge is liable to end up eating grass (it nearly happened). I made a calculated guess that we'd handle it and we did. Phew! If the ground is wet, be prepared to wash your shoes afterwards - or wear gumboots. We must have taken half the field away with us. National alpaca farm days are held annually and farms open their doors to the public. Products are displayed and visitors can meet the animals for free. Generally held the first Sunday in May. Notice is required for bookings (do this via the website or email) because the owners have to set up beforehand. 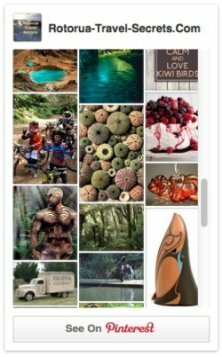 Surico is located in a rural area 16km (20 min drive) out of Rotorua. On the way, pass through Ngongotaha township (you can find food there) and continue until you get to the left-hand turn-off onto Tauranga Direct road. Continue for about 2km until you reach the sign-posted driveway on the left. The driveway up to the farm is gravel and single-laned. At the top is a small parking area. Behind that, the farmhouse. Besides Surico, the marker (top of google map) is the location of TECT All Terrain Park. Get a rush on the high-wire adventure course or have some fun on the running/walking, mountain bike, or motor-cycle tracks. Freedom campers are most welcome at the purpose built site. The other marker is the location of Hamurana Springs, another popular place to visit.